To Cite: Singh J, Singh G, Kannan S, Rai D, Gupta A, et al. Comparison of Torquing Ability of 0.019” × 0.025” Nickel Titanium and Fiber Composite Archwires: A Cone Beam Computed Tomography Study, Iran J Ortho. 2016 ; 11(2):e5967. doi: 10.17795/ijo-5967. Background: Increase in the number of adult patients seeking orthodontic treatment for aesthetics, demand for a more aesthetic orthodontic appliance has become inevitable. Objectives: This prospective study was undertaken to evaluate torque expression of 0.019” × 0.025” fiber composite wire and 0.019” × 0.025” NiTi wire in a similar prescription bracket systems (MBT, 0.022” slot) using CBCT. Methods: Twenty arches each (ten maxillary and ten mandibular), of 15 - 25 year old patients, were bonded with metal brackets and ceramic brackets having MBT prescription and 0.022”slot. 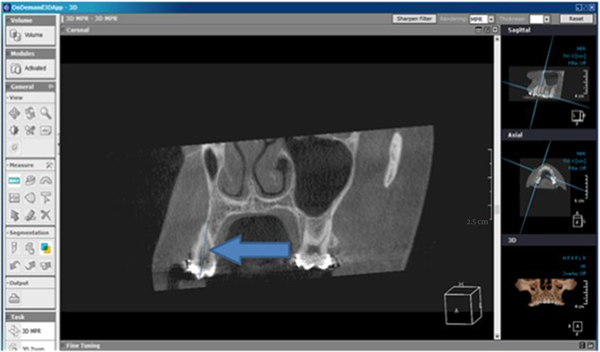 Two CBCT images were recorded at T0 and Tx. T0 point represented the stage of transition from a 0.017” × 0.025” NiTi wire to a 0.019” × 0.025” fiber composite or NiTi archwire. The Tx time point represented the end of treatment phase using 0.019” × 0.025” dimension wire, i.e. after 3 months of T0 scan. Results: The mean angulation change from T0 to Tx in fiber composite wire group and NiTi wire group was tested using Wilcoxon signed rank test and showed that the difference was statistically non-significant (P > 0.05). Conclusions: It was concluded that fiber reinforced composite wires were comparable to NiTi wires in their ability to deliver consistent forces and bring about comparable torque in individual teeth. Increase in the number of adult patients seeking orthodontic treatment for aesthetics, demand for a more aesthetic orthodontic appliance has become inevitable. The development of orthodontic appliances and materials with acceptable esthetics for the patient and optimal technical performance for the orthodontist has, therefore, become an essential goal of present day research. With the invention of revolutionary aesthetic brackets, like ceramic and polycarbonate brackets (1, 2) which are practically invisible, the need for the aesthetic wires has become very strong. This has lead researchers to try and develop a conventional yet completely aesthetic orthodontic treatment modality. Fiber reinforced polymeric wires are composites where wires are composed of ceramic fibers that are embedded in a linear or cross-linked polymetric matrix (3). These fibers can be as strong as the strongest piano wire and can vary in stiffness from that of the most flaccid multistranded wire to nearly that of a TMA wire. When these are compared to NiTi wires, resilience and springback were found to be comparable (3). These Fiber composite archwires do not get stained in the oral environment and thus provide a better aesthetic solution for the orthodontic patients (4). These composite round wires have been successfully used for treatment of alignment and leveling of teeth 5. With the advent of rectangular fiber composite wires, it’s now possible to carry out complex tooth movements without compromising on esthetics. Realization of a functional orthodontic wire made out of composites has not been achieved until recently (5). These composite round wires have been successfully used for treatment of alignment and leveling of teeth (5). With the advent of rectangular fiber composite wires, it’s now possible to carry out complex tooth movements without compromising on esthetics. Composite wires have a unique property, wherein, it is possible to vary the stiffness of the wire without changing its cross-sectional profile. This functional advantage over metallic wires allows practitioners to practice variable-modulus orthodontic technique (6, 7). These wires may also provide a viable alternative in patients allergic to nickel (8-10). Correction of malocclusion requires precise control of tooth movement in all three planes of space i.e. bucco-lingual (in-out), mesio-distal (uprighting), and tooth inclinations (root positioning). Control of tooth inclinations are commonly referred to as torque (11) in orthodontics. With the advent of pre-adjusted edgewise bracket, the position of an individual tooth is built into the bracket. So the expression of the in-built torque of a bracket is a matter of sequentially increasing the wire dimension till the bracket slot is fully filled. However, torque expression is a result of the interaction of many factors: bracket design (12), wire / slot play (engagement angle) (12), mode of ligation, 12 bracket deformation (13), wire stiffness (12, 14), magnitude of wire torsion and dimension (13, 15-17), and wire edge beveling (18-22). Clinical factors such as initial tooth inclination13 bracket position (14, 23), and tooth anatomy (24-27) are also determinants of torque expression. Orthodontic bracket manufacturers have sought to address these factors by pre-angulating the bracket slot relative to the bracket base. The prescription of slot angulations varies between manufacturers, and some manufacturers offer a range of slot angulations to suit the needs of individual patients. The relative contribution of wire type to torque expression has not been well defined. Without proper torque expression the stability of the treatment will be jeopardized. The current literature on torque expression in orthodontic brackets consists of theoretical models and discussions and in-vitro studies employing various measurement devices, brackets, and wire dimensions (12-14, 18, 28-34). In the absence of in-vivo studies, extrapolating, the results so obtained, to various clinical settings may not be accurate for any given bracket and archwire combination. With the advent of 3D radiography like computed tomography (CT) (35) or cone beam computed tomography (CBCT) (36) it is possible to see and appreciate the changes in crown or root angulations during orthodontic tooth movement. The tooth inclinations or the third order changes which were difficult to define by conventional Orthopantomograms and lateral cephalograms have been overcome with the use of CBCT scans. Due to the lack of sufficient clinical data / studies, it was thought necessary to evaluate torque expression of 0.019” × 0.025” fiber composite wire and 0.019” × 0.025” NiTi wire in a similar prescription bracket systems (MBT, 0.022” slot) using CBCT. This will enable us to compare the two wires for their use clinically and, it might allow us to provide a complete aesthetic solution for the orthodontic patient. Twenty arches (ten maxillary and ten mandibular) each were bonded with metal brackets and ceramic brackets having MBT prescription and 0.022”slot. These patients were in the age group of 15 - 25 years and demonstrated a reasonable ability to maintain adequate oral health. All brackets were bonded by a single operator. •Patients requiring / undergoing non-extraction treatment. •Full fixed orthodontic appliance in place. •Absence of active dental disease. •Signed informed consent for orthodontic treatment as well as for multiple CBCT scans. •Patients with individual contact displacements over 0.5mm at the start of the first scan (i.e. T0). •Cases which required extraction of teeth. •Patients who lack compliance to appliance maintenance and oral health. •Patients NOT ready to undergo CBCT evaluation. The T0 point represents the stage of transition from a 0.017” × 0.025” NiTi wire to a 0.019” × 0.025” fiber composite or NiTiarchwire. The prerequisite for reaching T0 stage was when the 0.017” × 0.025” NiTi was in place for at least 6 weeks. 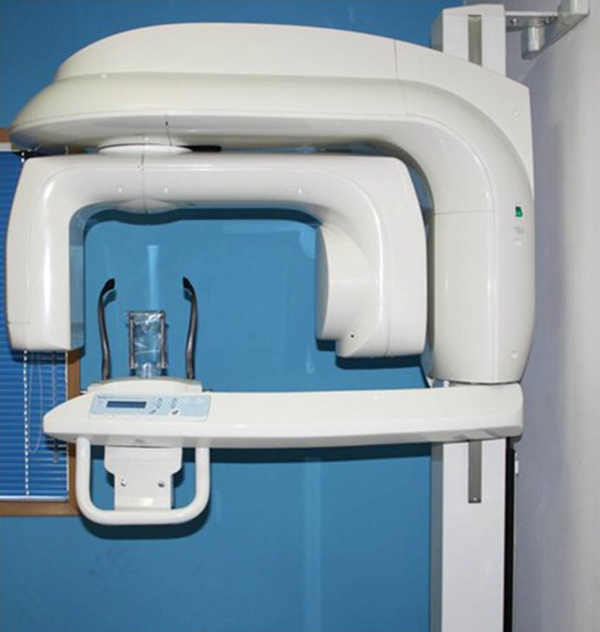 At this stage, the first CBCT scan was done. Fiber composite archwires or 0.019” × 0.025” NiTi (Figure 1 A and B) were engaged in the metal and ceramic brackets respectively and secured to the bracket using elastomeric ligature ties. The fiber composite archwires were replaced after 6 weeks as per the manufacturer’s recommendations. The Tx time point represents the end of treatment phase using 0.019” × 0.025” dimension wire, i.e. after 3 months (29) of T0 scan. At this time a second CBCT scan was done. 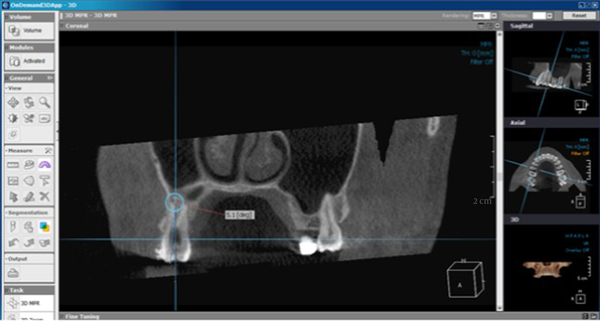 CBCT Imaging was undertaken at T0 and Tx i.e. at the time prior to insertion and at the removal of 0.019” × 0.025” archwires. The wires were removed immediately prior to the scans to reduce artefacts on the images. All the patients were scanned in a standing position with their FH plane parallel to the floor which was guided by the laser markers in the CBCT machine (Figure 2). 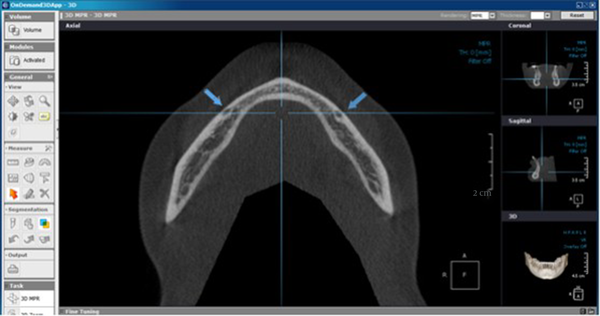 The subjects were scanned at 200 micron resolution with an occlusal bite platform between the upper and lower arches, uniformly contacting the occlusal / incisal surfaces of teeth. 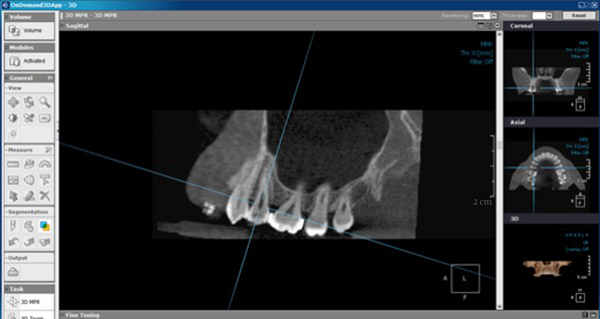 Volumetric datasets were automatically reconstructed using Kodak dental imaging software to generate parasagittal, paracoronal and paraxial sections. 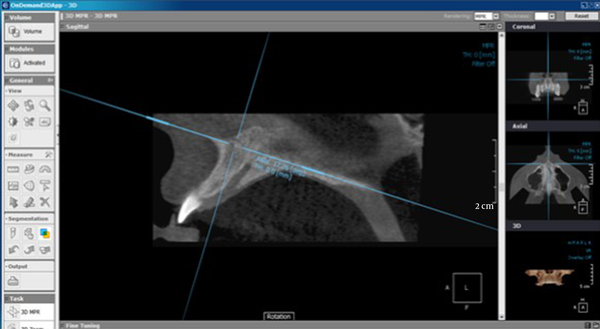 Basic images of thickness 0.2 - 1.0 mm at 0.2 - 0.5 mm intervals were used for analysis and measurements with interactive CBCT software. Before the actual measurements, planes and sections were standardized. The torque expression was measured by taking the change in inclination (labiolingual) of teeth before and after insertion of 0.019” × 0.025” NiTi or 0.019” × 0.025” fiber composite archwire. The torque change was measured in the coronal section for the posterior teeth and sagittal section for the anterior teeth. In the coronal section, a line connecting the root apex and buccal cusp tip was taken as the reference long axis of the posterior teeth. In case of multirooted tooth or bifurcated root, a line connecting the buccal cusp tip and buccal root apex was taken as the reference long axis (Figure 3). For anterior teeth, a line connecting the cusp tip / incisal edge and root apex was taken as reference long axis in the sagittal plane. 1. ANS - PNS line was aligned in the sagittal plane (Figure 4), tooth inclinations were measured between a line perpendicular to this plane and the reference long axis of the tooth. 2. The ANS-PNS plane was aligned at the level of CEJ of second bicuspid (without changing its inclination) in the first quadrant (# 15) (Figure 5). This enabled standardization of the axial plane for all upper arch measurements. 3. The standardized axial plane was used to align oblique coronal and sagittal planes perpendicular to the mesio-distal and bucco-palatal long axis, respectively, for each tooth (Figure 6). 4. The ‘angle’ tool was used to measure angulation between the reference long axis and a line perpendicular to ANS-PNS line. For posterior teeth measurements were calculated in coronal sections (Figure 7). For anterior teeth, angulations were measured in sagittal sections (Figure 8). 1. In the axial plane bilateral mental foramina were localized and a coronal section was obtained at this level (Figure 9). These bilateral anatomical structures were used because they are easily identifiable and reproducible and do not change over a short duration of time. 3. The standardized axial plane was used to align oblique coronal and sagittal planes perpendicular to the mesio-distal and bucco-lingual long axis, respectively, for each tooth. 4. The ‘angle’ tool was used to measure the angulation between the reference long axis and a line perpendicular to right and left mental foramen line. For posterior teeth, measurements were calculated in the coronal sections. For anterior teeth, angulations were measured in sagittal sections. All the teeth from second bicuspid on one side to second bicuspid of the contralateral side in both maxilla and mandible were evaluated for the change in their inclinations. Difference in the T0 and Tx values gave the degree of inclination change. Since the data did not follow a normal curve, non-parametric tests were used. Mann Whitney test was used to compare the mean between two groups. Wilcoxon test was used to compare pre and post readings within groups. Standard error of mean was also calculated and (P < 0.05) was considered statistically significant. 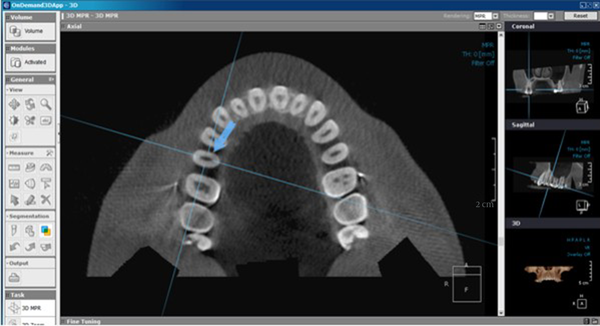 The mean inclination change was seen on CBCT images at the time of placement of 19” × 25” fibre composite wire or NiTi wire (T0) whereas second reading was done three months after placement of 19” × 25” fibre composite wire and NiTi wires respectively (Tx). Both the groups were tested using Wilcoxon signed rank test. Probability (p) values less than 0.05(< 0.05) was set to be statistically significant. Result showed significant change in the inclination of right maxillary canine and left maxillary lateral incisor whereas it was found to be non-significant in other teeth (Table 1). Whereas in patients in which NiTi wire was placed showed significant difference only in right mandibular central incisor in other tooth it was found to be non-significant (Table 2). The current literature on torque expression in orthodontic brackets consists of theoretical models, discussions and in-vitro studies employing various measurement devices, brackets, and wire dimensions (12-14, 18). Despite the abundance of empirical and research data on torque expression (28-34), none of the studies took into account the curved section of the arch as simulation models were done using straight pieces of wire. In the absence of in-vivo studies, extrapolating, the result so obtained, to various clinical settings may not be accurate for any given bracket and archwire combination. Therefore, this study was undertaken to compare the torquing ability of fiber composite and NiTi wires of the same dimension (0.019” × 0.025”) in a similar prescription bracket (MBT, 0.022”slot). Twenty arches each were bonded with metal and ceramic brackets to evaluate the torque expression of the above mentioned wires by measuring the change in the inclination of teeth. All the brackets were bonded by a single operator to reduce any possible error (14, 23). To evaluate the clinical efficiency of the wires vis a vis torque in-vivo, a CBCT based model was prepared. This was made possible because of the 3D approach to data acquisition and image reconstruction. It also lets us evaluate the total change in inclination of individual teeth and not just the crowns. The current study is also the first attempt to evaluate torquing ability of an aesthetic wire. The current study measures the change in inclination by taking the reference long axis of the teeth as a guide to evaluate the torque expressed. These reference long axes were not affected by abnormal crown or root morphology. Previous determinations of ideal faciolingual inclinations have evaluated facial surface contours by a variety of methods on untreated ideal occlusions, treated occlusions, and tooth positioner setups (28, 30). These studies have clearly demonstrated that facial surface contours relative to coronal long axes are subject to normal biologic variation (26, 28, 30). Hence, the validity of using these surfaces to evaluate faciolingual inclinations has not been established. Variation in the long axis of the crown to the long axis of the root (collum angle) necessarily results in different faciolingual root positions inspite of constant crown positions (26). 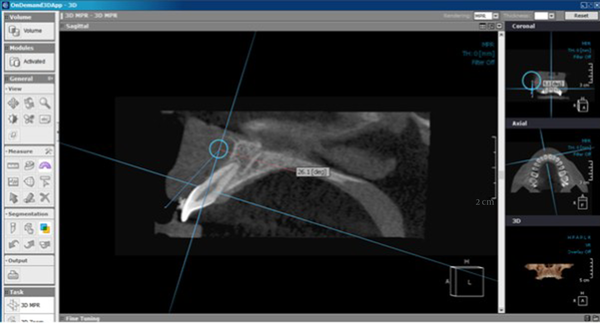 Since it was required to evaluate the change in inclination of teeth after the insertion of 0.019” × 0.025” NiTi or fiber composite wire, it was imperative to standardize their inclination before the first scan which would have otherwise given aberrant values. Therefore, after the initial leveling and aligning, a baseline wire (0.017” × 0.025” NiTi) wire was kept in place for atleast six weeks before the first scan. Both ceramic and metal brackets of similar prescription (MBT, 0.022”) were used in the study. The torquing capacity of various brackets using the orthodontic measurement and simulation system (OMSS) was evaluated and it was found that ceramic brackets were comparable to metal brackets in producing the highest torque moment and having the lowest torque loss.10Hence only two groups were taken, one group having fiber composite engaged in ceramic brackets and the other group having NiTi wire in the stainless steel brackets. Another reason for taking only two groups was that the sole purpose of the fiber composite wire i.e. aesthetics, would be lost if they are used along with metal brackets. For the measurements, tooth inclinations were recorded for all the teeth from second bicuspid of one side to second bicuspid of the contralateral side for both maxilla and mandible at time T0 (before insertion of 0.019” × 0.025” NiTi or fiber composite wire) and Tx (3 months post insertion of 0.019” × 0.025” NiTi or fiber composite wire). Difference in the T0 and Tx values gave the degree of inclination change. Anatomical landmarks away from the actual field of movement were chosen to enable the standardization of the planes and thus the scans. A line perpendicular to ANS-PNS plane set at the level of CEJ of tooth # 15 was chosen for measuring changes in inclination of teeth in maxilla, and for mandible, a plane passing through mental foramina set at the level of alveolar crest of tooth # 45 was chosen to evaluate change in inclination of mandibular teeth. These landmarks were easy to identify and reproduce and did not change over the duration of the study. Every tooth was evaluated two times by the same observer with a gap of three weeks between measurements and the mean was taken for statistical evaluations. This was done to avoid any inter-operator and minimize intra-operator error, respectively. The data obtained, was checked for assumption of normality. Since the data did not follow a normal curve, non-parametric tests were used. Mann Whitney test was used to compare the mean between two groups. Wilcoxon signed rank test was used to compare pre- and post- readings within the groups. Level of significance was evaluated so as to see if the results produced (change in inclination) across the patients were consistent. Finally, the sample ignored all withdrawals (drop outs) and non-responders, so the analysis only consisted of subjects who fully complied with the treatment. The arch form and dimensions were standardized by using the arch wires manufactured by the same manufacturer. To provide further consistency to the mode and method of ligation, only Ormco elastomeric ligature ties were used. These were also applied using a Straight shooter gun. The use of the same material and a similar stretch of the modules produced by the use of the straight shooter gun would have led to similar loss of elasticity of the ligating module and enabled the archwires to be forced into the bracket slot with the same force. This was primarily done to avoid the mode of ligation to be a factor causing the lack of torque expression (10). The results of the study showed that change in inclination of nearly all teeth in the fiber composite group did not vary across patients (Table 1). This implies that the fiber composite wire was able to produce uniform inclination change consistently among all the patients included in the study. Maxillary right canine (# 13) and maxillary left lateral incisor (# 22) showed a statistically significant variable inclination change in fiber composite wire group (Table 1). The change in inclination of all teeth except mandibular right central incisor, in the NiTi group did not vary across patients, implying that the NiTi wire was also able to produce uniform inclination change consistently in all the patients (Table 2). Mandibular right central incisor (# 41) showed a statistically significant variable inclination change in NiTi wire group (Table 2). Lack of uniformity in torque expression pertaining to the aforementioned teeth i.e. maxillary right canine (# 13), maxillary left lateral incisor (# 22) and mandibular right central incisor (# 41) can partially be explained on the initial inclination (13) of these teeth before starting the treatment. It can be attributed to ectopically placed canines in the vestibule and lingually blocked out incisors. These teeth usually require extra torque to put them in their ideal position. By comparing the expression of torque expressed by these two wires, the results of the study showed that both fiber composite and NiTi wires are capable of delivering a consistent torquing force to produce resultant inclination change of teeth. Hence it can be interpreted that torquing abilities of both these wires are comparable. The results extrapolated from the study are from a small sample. The statistical analyses also showed that most of the values obtained are statistically non-significant. However, this does not imply that the results are not clinically applicable. Future studies with a larger sample should be conducted to substantiate the findings of this study. Moreover, the discrepancy reported on teeth having aberrant values could have been avoided, if case selection criteria would have considered the inclination of teeth before the start of the treatment. Future research should evaluate and take this parameter into account. In the present study, molars were not taken into consideration for evaluation of change in inclination. This was due to the artifacts produced in CBCT scans by molar bands and tubes making it difficult to correctly locate the long axis of the molars. Moreover the torquing effect of a 0.019” × 0.025” SS wire have also not been studied in-vivo. Future studies should also evaluate torque expression of 0.021” × 0.025” wires to evaluate the maximum torque expressed when the third order clearance / play is least, between the wire and the bracket slot. On considering the previous literature it was also found that stainless steel wires were taken as standard for comparison (12, 13, 18). This study could have considered a third group having stainless steel wire to evaluate their efficacy in delivering torque and then comparing NiTi and fiber composite wire with stainless steel wire taking it as a reference. The easiest of all studies are done in laboratories under simulated situations. It could very well be argued that this study basically compared the torsional capacity of the two archwires and hence could have been done in a laboratory set-up. But by conducting a clinical in-vivo trial it was proven that with a difference in the wire edge beveling and with the fiber composite wire being far softer than the nickel-titanium wire, they are still able to produce consistent tensional forces for the dentition selected. Here it would be pertinent to mention that these wires can be customized and hence additional torque can be incorporated into the wire even in the aligning phase of the treatment. This capability of being available in customized form gives the wire an edge over any wire available to the orthodontic community till date. Also, the study comprehensively proves that the fiber-composite wire could provide an aesthetic alternative to previously available coated wires.